I love sweet, savory and spicy Asian food. Every once in a while we order from this awesome local place, but lately we’ve saved the cash for other things. Delivery can run upwards of $30 for an appetizer (got to have cream cheese wontons), two entrées, and don’t forget tip. Now that it’s spring, I’m also trying to lighten-up our dishes. Last night I needed a sticky rice fix something fierce and happened to have all ingredients needed for one of our all time favorites. This is a nice and light version with lots of bright orange flavor that happily serves two – with leftovers for lunch the next day. If you love lots of sauce, you might want to double the ingredients. I like a nice, thick coating of sauce on my chicken, not a big pool of it leftover on our plates. Adding a touch of grated orange peel really kicks the orange flavor to a whole new level. But, if you’re not into that, just leave the grated orange peel out – it’s still tasty. So steam up some broccoli and fluff (or sticky-up) your rice – this orange chicken recipe is low in calories, easy on your wallet, and takes minutes to toss together. Oranges are in season right now so are super cheap and super sweet. Using fresh squeezed really gives this recipe that spring-fresh flavor. Squeeze the orange juice making sure to strain for seeds (no one wants to chomp down on a crunchy bit while enjoying tasty orange chicken!). Chop and add the garlic to the orange juice along with the rice wine vinegar, ketchup, sugar, soy sauce, dried ginger, red pepper flakes, salt and pepper, and orange zest (if you want). Give things a whisk and let sit while preparing the chicken. Chunk up the chicken and then add to a zip-top plastic bag. Sprinkle the flour, salt, and pepper over the chicken, seal the top, and shake-a-shake. Heat a non-stick skillet over medium-high heat and add the canola oil. Here’s the deal – you really need a non-stick pan or a wok to make this happen. I’ve tried using a regular skillet (and a really good one) and the chicken sears to the bottom, making a big mess. Toss the chicken until it’s browned and happy all over, which takes about 5 to 7-minutes. Remove the chicken from the pan and let rest on a few folded paper towels. Now add that orange sauce to the hot pan and let bubble. After the sauce has simmered for about 2-minutes, add the chicken, stir to coat and continue to reduce for another minute. Serve over a nice big pile of hot rice, a side of whatever veggies you love, and a sprinkling of chopped scallion. 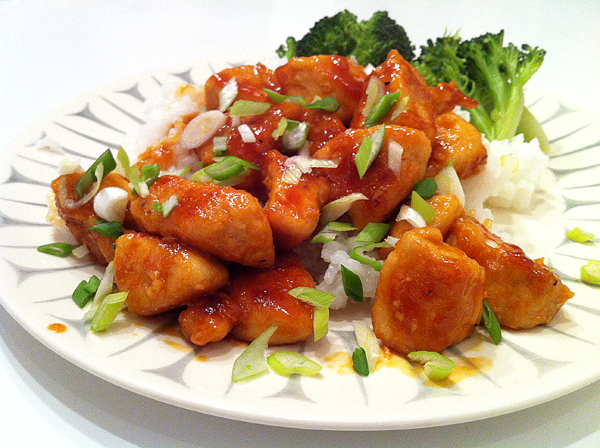 Comes in right around 300 calories per serving – add steamed white rice and you’ve got a 500 calorie dinner.